2014 Week 34: God help this girl! This week: God Help the Girl @ Music Box. Used a PTO day and moved 600 lbs. of Rani’s stuff to Patricia’s and then drove Codex to Chicago Exotics for her Revolution treatment. Screening of The One I Love @ Landmark. Double doctor. The second to last ever Dragonlady vegan korean/latin buffet. Lunch with Rachel S. @ Breakfast House. Found a wounded squirrel/arranged for pick-up by Flint Creek Wildlife Rehabilitation. Late bday dinner for Jason @ Jerry’s. Sold Rani’s massage table. Cities of Darkscorch @ Donovan & Dillon’s. Robyn/Röyksopp @ Pritzker Pavilion. Stressed, but checking off boxes. Busy with Renegade prep. Fun, fun, fun. Rhymes with Twee and di Palermo Body are Booth 280 at Renegade Craft Fair Chicago on September 6th & 7th. Such a great movie week. Every one but FD5 is worth watching. My twee-ometer readings were off the chart while watching God Help the Girl. 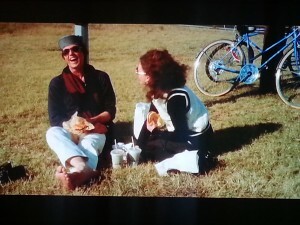 Tandem bicycle = check. Adorable puppy = check. Young unrequited love = check. Mod clothing = check. I loved it beyond words. The Apple was similar to The Who’s Tommy in its spectacular productions, far out costumes, and gorgeous sets – definitely worth watching! Go into it blind. Don’t read anything about The One I Love. Just go see it. Elizabeth Moss & Mark Duplass are EXCELLENT in it. Truly the best acting I have seen this year. I still can’t believe that this is Charlie McDowell’s first feature film, granted he is Malcolm McDowell & Mary Steenburgen’s child. I loved it. The Way Way Back was not deep, but it was a good coming of age film. Hands down, the best part of the film was when Sam Rockwell’s character asks for help by speaking the lyrics to Bonnie Tyler – I Need a Hero and now that song has been in my head for days. Z and I hadn’t seen Micmacs since it was in the theatre, but again, this one is a favorite Jean-Pierre Jeunet film alongside Amélie. 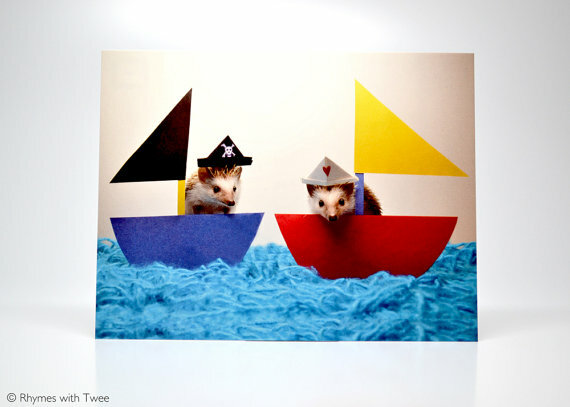 I am a proud momma of the newest Rhymes with Twee hedgehog postcard ‘Alasdair & Magoo sail the twee,’ which required a wee bit of Photoshop magic on my part since I had to blend two photographs together since the boys were so squirmy. I am so grateful to have a sweet memento of the boys before they went to their new homes. It might be the most twee hedgehog postcard I’ve done thus far. Buy them. Tell your friends to buy them. Pin the heck out of it. All that jazz on the internet. They’re on the Etsy shop. This week: Quesadilla with the boo. Lunch with Gretchen @ Epic Burger. Lunch with Christy @ Big Delicious Planet. UVNA Meeting @ Whisk. Dinner with Stacy @ Tamale Spaceship. Fantastic cocktails with Stacy at Bar Takito’s friends & family night – the space is so gorgeous! Cinchel @ Transistor. Dinner @ Melrose Diner. Katniss recheck at vet/brought Art3mis in because her face was pink – ended up that she had ear mites, so we had to treat all the hedgies with Revolution. Thomas Street Block Party. Sold at Pilsen Flea Market with buddy Abbey Christine! 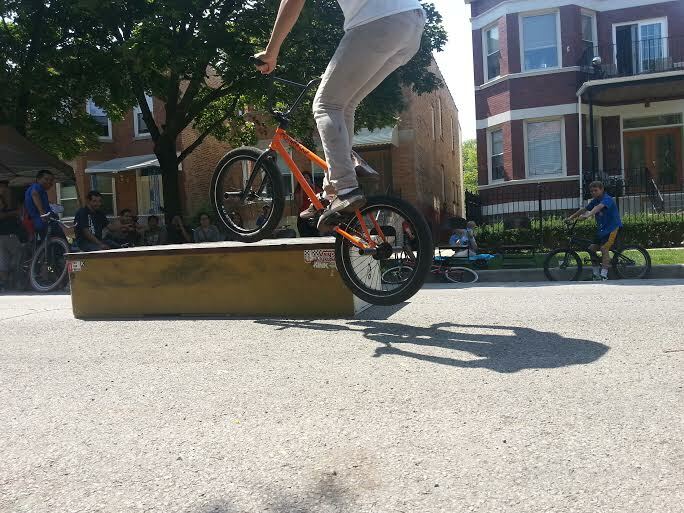 The 2100 Thomas Block Party was really fun. With everything going on, Z and I thought we’d just drop by, but we stayed for a few hours talking to neighbors, hanging out with adorable dogs, and watching a Neil Young cover band. I’ve talked about my love of my neighborhood Ukrainian Village before, but there are many interesting, kind, and inspirational people living on my street. I met a neighbor whose backyard has chickens, a beehive, and a beautiful garden – something to aspire to! With all the hard work I’ve been putting into Rhymes with Twee lately, it is a bummer to get a craft fair rejection. I didn’t get into the Chicago Art Girls pop-up December 13th & 14th, but if I don’t end up finding another show that weekend, I’ll go as a shopper. It is a really great group of artists and crafters. So many awesome ladies I can’t help but be a tad bummed not to be one of them. C’est la vie. Pretty good week for movies. I liked them all, but Safety Not Guaranteed was probably the one I enjoyed most – it’s rare when a movie ending surprise me, but it did. I love Aubrey Plaza – she is just dang cool. The production value of this Hobbit was really crap though; not sure why it looked so terrible. 2014 Week 32: Where my PEAPS at? This week: Doctor’s Appointment. Doctor/dentist 1/2 punch. Dinner with Donovan @ Handlebar. Applied for Chicago Art Girls winter pop-up. Alasdair & Magoo photoshoot. 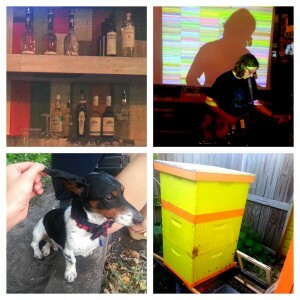 PEAP block party – our friend Adam Sebastian is one of the organizers and he invited us to check it out. 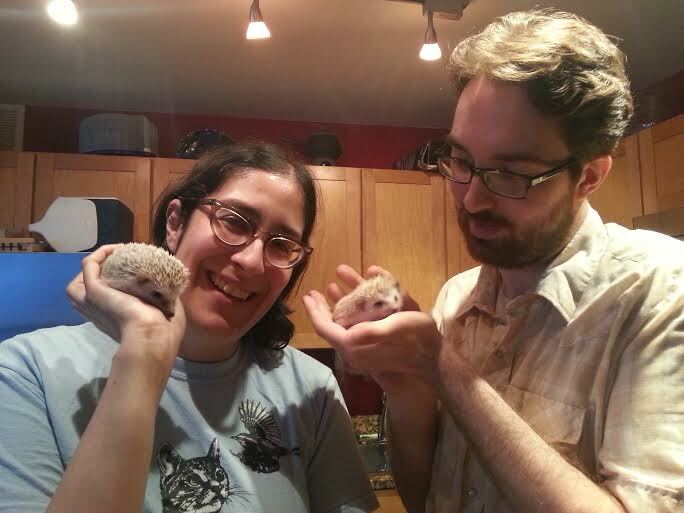 Dropped Magoo & Alasdair off with Christina (Hedgehog Welfare Society) for their rehoming – we love those little boys, but we are happy they are going to good homes. Sunday was spent on a whole bunch of chores, meeting the Shanleys new kittens(! ), and finishing packing up Rani’s stuff with Emily. I hadn’t watched Soylent Green since high school, but it was way better than I remember it being and very scary when watched in this day and age. Ernest & Celestine was a wonderful twee cartoon. Much of it is set in a candy shop, even! 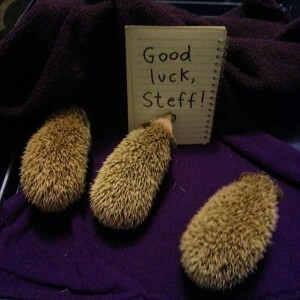 LA friends, take care of Steff! She is awesome. In googling the lyrics for the Hood song I quoted in the title, I found a post about them here. I am willing to bet I know or at least know friends of friends of the person that wrote it. This song randomly popped into my head while pulling together this post. There is a lot going on in my life and I feel spread so thin; there’s simply not enough tasty jam to get to the edge these days. When I went to Steff’s going away party, I got a little teary. This was a bit funny since Steff and I are truly more acquaintances than friends, though I think if both of us had more free time that we would have been friends. She is rad and I am rad and we share a gaggle of friends in common. 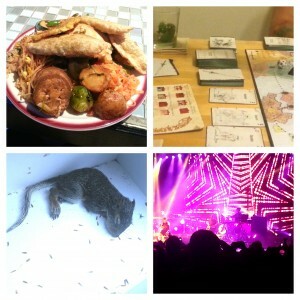 It just hadn’t worked out that we had hung out except for at craft fairs and maybe twice or thrice outside of that. Her going away and seeing all the people that loved and admired her reminded me of when I left the DC area for Chicago and all the love felt there and what truly makes someone a good friend. How some people you can not see for years upon years and then when you do, it’s like no time has passed whatsoever. I am very lucky to have such amazing friends in my life. Hold onto these people, dear readers. Laini’s birthday was Saturday. I always try to do something she would have particularly enjoyed on her birthday and anniversary of her death and this year Saturday was somewhat a bust. I got to see Guardians of the Galaxy 3D with Jerroid, after a thwarted attempt to get near Showplace Icon with Lolla down the street, we wound up at Regal Webster Place but had to get seats 10 away from one another. I think Laini would have dug the movie though. I did right by Laini Sunday by going to Greek Islands with Z. He calls it the Greek version of Epcot Center and it reminds me of the place I used to go with Laini, IKAROS (which I didn’t know had moved in 2012). Googling it brought some tears to my eyes. Happy memories of that place with Laini, or just picking up spanakopita for her mom, Dorothea, from there. This week: Emily and I began packing Rani’s stuff Tuesday night. Another 6am spin class with my fave Julie S.! Steff’s going away party @ Parson’s. Art3mis & babies wellness check @ Chicago Exotics. Deleece with Z. Guardians of the Galaxy with Jerroid and he dropped me off at Rivers “Lame” Casino (was meeting Z and Red Lobster reveler friends there – I should not have gone). More packing Rani’s stuff with Z. Greek Islands with Z.
Welp, both of the films I watched were doozies. Basically, Brainstorm is about a technology like Google Glass if it could kill. #googleglassthatkills It was very enjoyable even though the ending was convoluted. The special effects are flipping amazing considering this was a 1983 film. Somehow I could not find a screenshot of that ridiculous image so what is above is a photo of our tv as Z and I watched it. All credit to the director Douglas Trumbull.